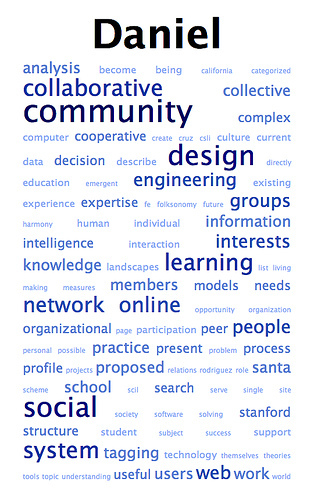 This is a word cloud/name tag I created at TagCrowd.com (a side project of mine) for a Stanford faculty retreat years ago. It’s still a pretty accurate picture of my interests. I created word clouds like this for every faculty member at the retreat to visualize their interests based on research statements and resumes. It was a treat to watch such great minds interacting and using the clouds as launching points for conversations. I encourage you to check out TagCrowd and play with making your own word clouds from your writings, resume, poetry, chat logs, or whatever suits your fancy.